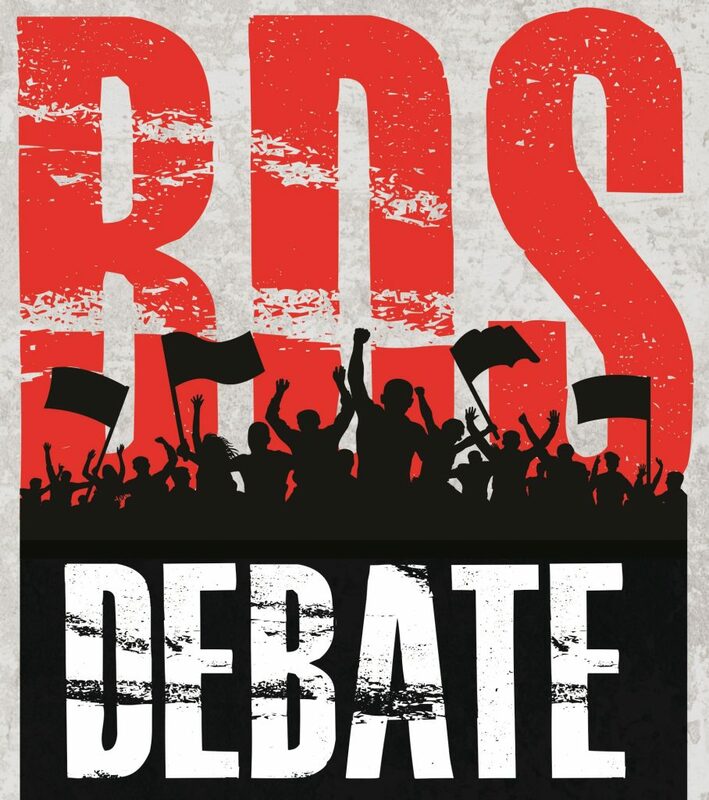 Feature DEBATE: Anti-BDS or Anti-Anti-BDS? BDS– Boycott, Divestment, and Sanctions – is a nefarious tool wielded by anti-Semites masquerading as anti-Zionists. Recognizing this, 26 states have enacted laws to make BDS illegal, and more are following. Our instinct is to rejoice at those laws for championing our cause and stopping the scourge of BDS. But are such laws really in our best interests, or might they have unintended consequences? It’s a matter of debate. Discrimination can and should be countered by governmental action to do whatever is legal to prevent government from aiding it in any way. The First Amendment to the Constitution of the United States guarantees that citizens be allowed to express themselves without being limited by the government. Thus, peaceful protest for or against any particular issue is generally protected by the highest law of the land, and serves as the bedrock of our democratic society. Previous Supreme Court rulings have expanded the protection of “speech” to include symbolic speech and other forms of expression, from sit-ins to flag burnings, demonstrations and the wearing of protest buttons. Yet precedent has also been set to allow the government to somewhat limit the scope of what may or may not be protected speech. In 1919, in the classic example of limitations of speech not protected by the First Amendment, the Supreme Court ruled in Schenck v. United States that yelling “Fire!” in a crowded theater is dangerous speech, and not protected by the First Amendment. Similarly, obscenities, fighting words, incitement to imminent lawless action and true threats are unprotected forms of expression. There is considerable debate about proposed and existing anti-BDS legislation as to its legality in relation to the First Amendment, which is beyond the scope of this commentary. Furthermore, one’s personal opinion of the law, beyond the question of whether it is proscribed by the First Amendment, may depend on how much of a libertarian view one has in the matter of anti-discrimination laws. Are the arguments set forth to prohibit BDS actions beneficial to the Jewish community or are they not? An argument opposing this legislation from a practical standpoint is that it may prove detrimental to us as Jews in the long run. Might not these very same laws prevent our community from protesting our own grievances? I believe this argument falls short on two very crucial points. Can this boomerang and, as it were, “come back to bite us”? Is it possible that we will be prohibited from calling for a boycott of a company or a government whose policies we do not agree with? Perhaps — depending on the nature of the boycott. If we decide, for whatever reason, that we wish to discriminate against an entity for racial, religious or other prejudicial reasons, then the government may tell us that it will not subsidize our endeavor with taxpayer funds. And we would deserve such limitations. However, the chances of that happening are slim, since the basis of any boycott we may call would probably be one designed to alter harmful policies, rather than a boycott based on bias. In the past, there has been talk of boycotting businesses that have aggrieved us as religious Jews. When a company implements policies that treat us poorly or that have a negative impact on our beliefs, we have the right — or even the duty — to express our displeasure by refusing to patronize that company or their services until they alter their practices to conform to our needs or desires. However, the impetus for these threatened boycotts is not one of bias. Rather, it is to persuade these entities to alter their policies. Ultimately, the boycotts were called off when the negotiated changes were implemented. Thus, there is no reason to fear that these same laws will come back to haunt us. On the other hand, non-discriminatory boycotts, which are used to influence policy changes, are part of the democratic system. Some may counter that the BDS movement is seeking to encourage a change in the actions and policy of the Israeli government, and therefore deserves the same protection as other boycotts. This brings us to the second point, the discriminatory nature of the fundamental principles of the BDS movement. This highlights the differences between BDS and calls to sanction other entities. Although the BDS movement claims that it is “merely” trying to call attention to what it says are harsh actions of the Israeli government against the Palestinians, it has been demonstrated time and again that the true goal of the BDS movement is the destruction of the Jewish state. Thus, contrary to their claims, the objective of the BDS movement is not just to effect a change in the policies and actions of Israel’s government; rather, the movement itself is mired in racism and discrimination. This in turn opens the door for a government to declare, through anti-BDS legislation, that it will not be party to the discrimination practiced by these bigoted people, and thereby precludes them from doing business with state agencies. This second point, which differentiates between the biased actions of the BDS movement vis-à-vis the nature of any possible policy boycott we may employ, should give us reason to redouble our efforts to combat the BDS movement with any and every weapon at our disposal. The objective of BDS represents an existential threat to Israel and its citizens. The Jewish nation is trained from time immemorial to face challenges of this nature with a trilogy of techniques: doron — the offering of financial incentives; tefillah — prayer; and milchamah — war. We have tried offering gifts. During negotiations with the Palestinians, Israel gave them self-rule in Yehudah and Shomron, and withdrew from Gaza, to no avail. They have shown that they are not interested in living side-by-side. Indeed, the leaders of the BDS movement acknowledge that their goal is not a two-state solution, but rather a one-state solution in which the Jewish nature of and presence in the region will be eliminated. Our hope is that our heartfelt tefillos will be heard On High, and we will succeed in our battle to defeat the scourge of the BDS movement in the legislatures and the courts. Even the best-intentioned laws and legal rulings create dangerous precedents that later come back to haunt us. A number of years ago I had an argument with a friend, a brilliant young man with significant knowledge of contemporary American law. The topic was the various civil rights laws which give protection to Jews, among other minorities. My friend, a self-proclaimed libertarian, insisted that for religious Jews, such laws were inherently a bad idea. While they may be helpful to us in some cases, in the long run, they will invariably clash with our own religious rights, he claimed. Back then, I shrugged off his concerns, and tried to make the case that the benefits of these laws — such as making it so much easier for a shomer Shabbos to keep a job — would outweigh any such drawbacks. 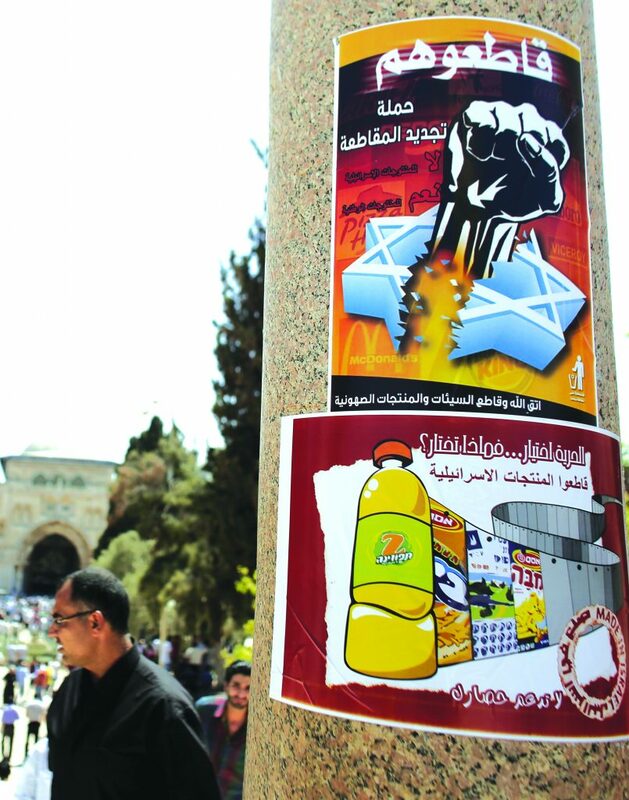 Two posters on Har Habayis, August, 2014. 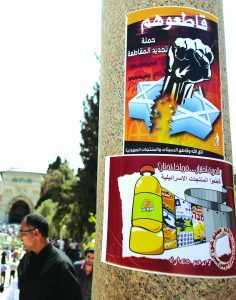 The bottom poster calls for the boycott of Israeli goods. Now I know that I was wrong. It has become increasingly clear to me that with the wave of progressive victories in both the judicial and legislative levels, as Torah Jews, we would have been better off without those legal protections. For, as challenging as it may be for a Jew to be turned down for a job because of shemiras Shabbos, or for a landlord to turn us away because of our religious practices, there generally are other employment opportunities or housing choices available where this bias is not present. But when the very same laws — or similar ones — are used to force observant Jews into renting their premises or providing services for events that are anathema to the Torah, Jews may have little recourse except to either betray their religious beliefs or go out of business. Recently there is much discussion about the anti-BDS legislation that has been passed in some 26 states and now is under consideration at the federal level. There is little doubt that the main motivation behind BDS (Boycott, Divestment and Sanctions movement) — at least at the leadership level — is old-fashioned anti-Semitism. Regardless of how strongly one may feel about the Palestinians’ “right” to a state of their own (an argument which lacks credence from both from a historical and moral standpoint), there is no logical defense for BDS. As any neutral observer would attest, the Palestinians already enjoy considerable autonomy throughout Yehudah and Shomron, and the reason the peace talks have stalled is that the Palestinians have steadfastly refused to come to the negotiating table. At the same time, I feel that instead of supporting anti-BDS legislation, we as a community should be opposing it. Even the best-intentioned laws and legal rulings create dangerous precedents that later come back to haunt us. Whether the anti-BDS legislation at the state level — which basically tells companies and individuals that they cannot do business with that state if they engage in BDS — is even constitutional is something that the Supreme Court will ultimately decide. A potent argument can be made that, although individuals have the right to boycott companies whose policies they disagree with, a government entity does not. Furthermore, while states can and should find anti-Semitism to be repugnant, it is not illegal to be an anti-Semite or to express non-violent anti-Semitic sentiments. What is generally considered illegal is a discriminatory boycott, such as one which is clearly anti-Semitic in its nature. While, as mentioned, there is ample reason to believe that the motivation behind BDS is anti-Semitism, it is far from certain that BDS would fall within these parameters. BDS doesn’t target all Jews — nor does it only target Jews. Its adherents do not seek to boycott American Jews, and they do boycott non-Jewish companies based in Israel. The Supreme Court has found that African-Americans in Clairborn County, Mississippi had the right to boycott local white merchants as a means to pressure them into acceding to a host of demands — that the entire staff of a local police force be replaced. At the same time, the right to boycott is a most important one for our community. Let us take the example of El Al, which for many decades was owned by the Israeli government, and still is Israel’s national airlines. Personally, I try to avoid buying tickets on El Al, not only because of the way they treat chareidi passengers, but because I never know when they will once again violate Shabbos and the Gedolim will call for a boycott. Technically, a boycott against El Al would probably not violate BDS legislation in its current form. But these anti-BDS laws create a clear precedent that would allow states to pass broader pieces of legislation that would include partial boycotts against Israeli or other entities on religious grounds. Even more troubling are the long-term ramifications for free speech. The Torah is the eternal truth. It also contains various prohibitions — and descriptions of those who transgress these prohibitions — that are not exactly politically correct. As it is, Torah-observant Jews have a hard enough time beating back legal harassment from the progressives. Every additional law that encroaches on free speech and libertarian rights will only come back to hurt us in the long run. Those who seek to emphasize the fact that the ACLU and other liberal groups may be on the pro-BDS side in this battle are missing the point. Ultimately it is the legal precedent that counts, and that is what we should be worrying about. Furthermore, it is important to bear in mind that while BDS in the United States may be a most unfortunate and even repulsive movement, it does not pose a substantial threat to the Israeli economy. As a recent study by the Brookings Institute indicates, given the basic structure of Israeli trade, the threat to the Israeli economy is minimal. 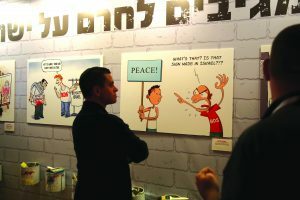 Fighting BDS has become an obsession of the Israeli government, perhaps as an attempt to cover up for its stunning failure when it comes to international PR. As Jews in exile, we must recognize that there will always be a certain amount of anti-Semitism — cleverly cloaked and otherwise — that Jews on both sides of the Atlantic will have to contend with. While requisite hishtadlus is obligatory in any situation, it is the opinion of this writer that this does not include using state legislatures to fight BDS.